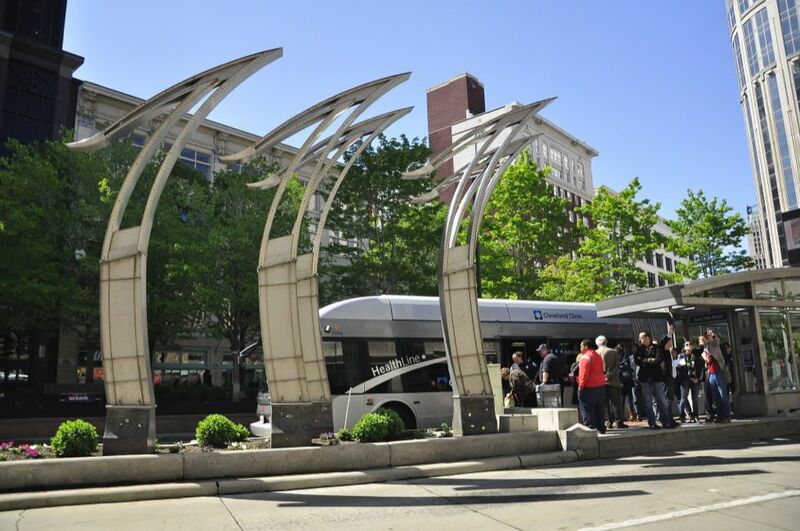 Cleveland’s HealthLine bus rapid transit system connects the downtown central business district with University Circle, a cluster of medical facilities and cultural amenities, via dedicated median bus lanes along Euclid Avenue. Completed in 2008, the 6.8 mile bus rapid transit corridor transports 16,000 bus riders a day, up from 9,000 daily prior to the redesign. The project cost $200 million, and more than $5 billion in real estate development—both new construction and rehabilitation—has since sprouted within a quarter mile of the transit corridor. Cleveland aimed for its BRT line to perform as close as possible to a fixed rail system in order to attract ridership and secure funding under the New Starts program, which prioritizes fixed guideway projects. Ultimately, the key to successful corridor design was buy-in from city traffic engineers and coordination between GCRTA and contributing agencies. Along the 6.8 mile Euclid corridor, right-of-way width and average daily traffic (ADT) counts varied widely. A 4.5 mile stretch with robust parallel roads had ADTs ranging from 7,500-15,000. Traffic models analyzing the effect of completely closing Euclid Avenue demonstrated that the parallel streets could accommodate the diverted traffic with minimal impact. These models equipped traffic engineers to defend decisions to remove one car lane on this stretch of Euclid to create a dedicated bus lane. Therefore, this 4.5 mile segment received a full right-of-way reconstruction including roads, utilities and sidewalks. The street now maximizes use of the 100-foot right-of-way with a dedicated bus lane and a thru lane in each direction; a center median that restricts drivers from turning in front of buses; left-turn bays at all intersections with a bus station; and on some blocks, bike lanes and/or parallel parking lanes. The remainder of the corridor, where ADTs reach 22,000-24,000, does not use dedicated median bus lanes: instead, buses operate in mixed traffic. The higher traffic volumes and lack of adequate parallel streets on this 2.6 mile segment precluded the conversion of a vehicle lane to a dedicated bus lane. This segment has two thru lanes in each direction, pocket parking, and bus stations in bump-outs that prevent buses from being trapped at the curb by car traffic. The 4.5 miles of dedicated median bus lanes save 10 minutes of travel time; the bus operating in mixed traffic with bus stations at bump-outs saves 2 minutes of travel time. Streetscape reconstruction also involved design elements such as public art, patterned brick sidewalks, granite curbs, street furniture, lighting, and extensive landscaping with more than 1,500 trees planted. Furthermore, GCRTA coordinated with other agencies’ utility projects: City of Cleveland replaced water lines and buried some of the street’s electrical lines, and the gas company replaced gas lines during the street reconstruction. One of the first major BRT systems in the U.S., Cleveland’s HealthLine was planned and built before the Institute for Transportation & Development Policy (ITDP) released its Bus Rapid Transit Planning Guide. 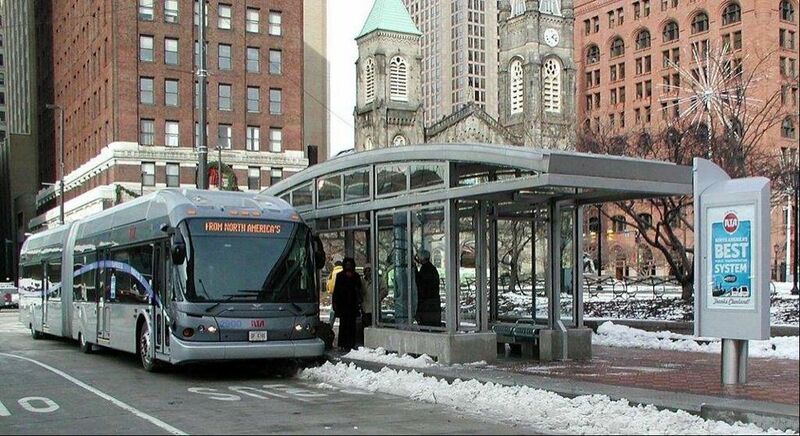 In the absence of guidance specific to BRT, Cleveland took lessons from center-running rail projects in cities like Salt Lake City and from bus systems with dedicated lanes in Boston and Los Angeles. The project met multiple design standards. Euclid Avenue is a U.S. route, so the project followed Ohio Department of Transportation standards for roadway geometry. The road is in Cleveland, so the project went through the City of Cleveland’s design review process, meeting the City’s design standards. As a New Starts project, it also had to meet FTA’s regulations, including a safety certification process for fixed guideway transit. An FTA project management oversight consultant ensured the project had robust design, adequate risk assessment, sufficient technical capacity, and that it coordinated with utilities to avoid cost overruns. 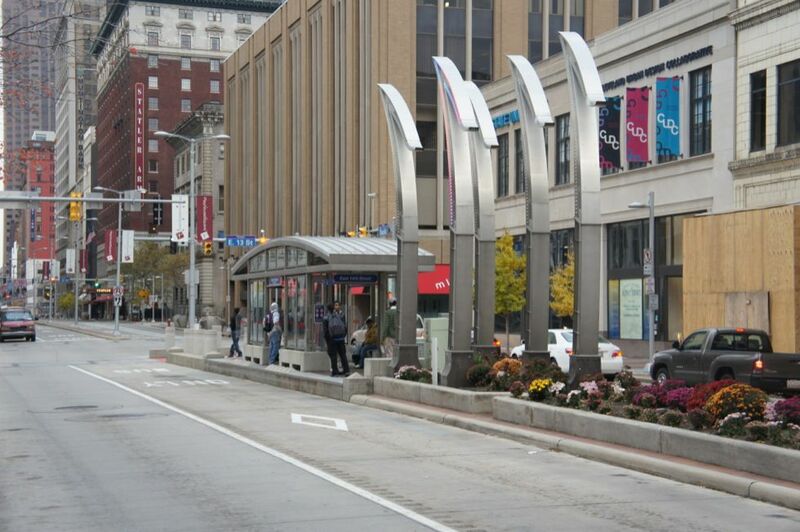 At the time of construction, no Americans with Disabilities Act (ADA) guidelines existed for BRT, so the Euclid Avenue project followed ADA’s rail standards. Accordingly, the HealthLine uses level boarding: the gap between the vehicle and platform is no greater than 3” horizontally and 1” vertically. GCRTA installed over 400 ADA ramps to station platforms and cross streets, as well as Braille signage and tactile edges on crosswalks. BRT stations along the Euclid corridor are designed to resemble rail transit. Raised station platforms meet the height of the bus floor, facilitating level boarding. Off-board fare collection increases efficiency. Real-time updates of bus arrival times provide predictability for passengers. Stations are well-lit and modern, constructed of glass and stainless steel, and include emergency blue-light phones and closed-circuit security cameras for public safety. Bus stations are located at the far side of intersections, allowing more efficient boarding and alighting. Pre-existing bus stations were consolidated along the corridor to reduce stop time. Traffic signal adjustments such as green time extension, intermediate phases, and queue jumps further improve bus speeds. To encourage passengers to use crosswalks to reach the median bus stations, Cleveland installed pedestrian count-down signals. Additional pedestrian safety measures include bollards to protect ramps, improved lighting at intersections, and significant signage on station platforms. 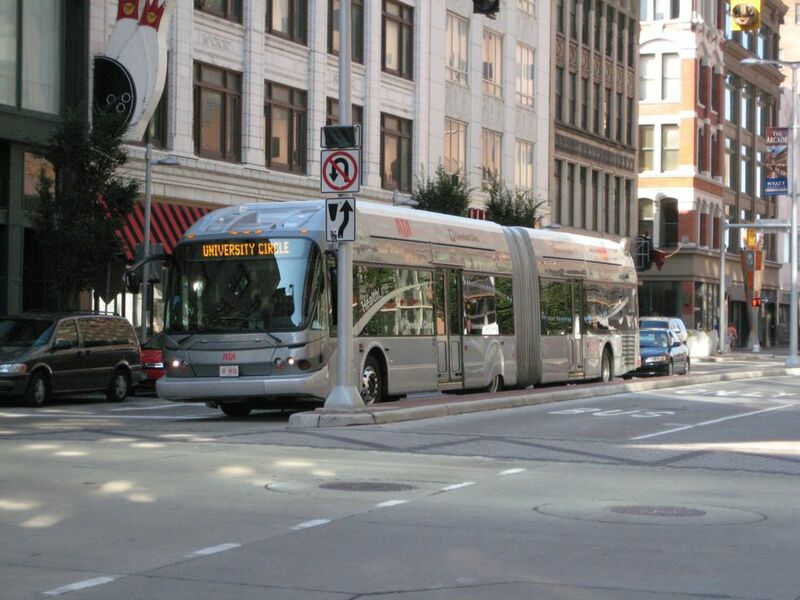 The sleek, silver, 63-foot articulated buses were specially designed for Cleveland. The diesel-electric hybrid motors produce 90% fewer emissions than regular buses. Each vehicle can carry 100 passengers and has five sets of doors located on both sides to allow right- or left-side boarding at medians or the curb. GCRTA held about 2,000 public meetings to conduct community outreach and assess the interests of various stakeholder groups and potential passengers. Bus ridership on Euclid Avenue has increased from 9,000 daily riders before the HealthLine, to 16,000 passengers daily as of 2013. The HealthLine operates 24 hours a day, 7 days a week. During weekday peak hours, buses arrive every 5 minutes. Headways increase to 15 minutes in early evening and 30 minutes late at night. Non-transit component: $31.6 million for streetscapes, utilities, art, etc. GCRTA prioritized the Euclid corridor since it demonstrated the most potential for a successful bus rapid transit line. 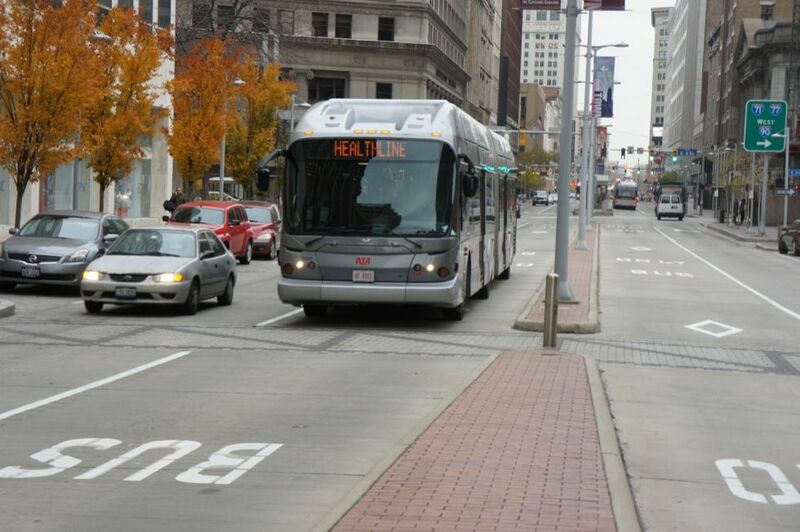 Following this project, Cleveland is applying lessons learned from the HealthLine to other bus routes in the city. GCRTA is considering 10 other corridors for improvements, and though none will be as robust as the Euclid corridor, these future projects will likely integrate elements of the HealthLine’s success to improve transit operations across the city.